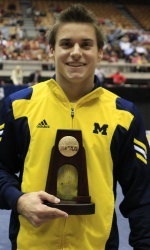 Posted on Thu, Feb 9, 2012 : 11:48 a.m.
Michigan gymnasts Sam Mikulak and Adrian de los Angeles were named to the U.S. National Team after their performances at the Winter Cup Challenge in Las Vegas last weekend. By qualifying for the team, Mikulak, a sophomore, and de los Angeles will be a part of the pool that is selected to represent the United States at the Olympic Games in London later this year. The duo will also participate in international competitions throughout the summer, while training with the team. Mikulak and de los Angeles were also named co-Big Ten Gymnasts of the Week because of their performance at the meet. The last time the Eastern Michigan men’s swimming and diving team lost a Mid-American Conference dual meet, a gallon of gas cost a buck, Bill Clinton was still in office and none of the current members of the team had reached middle school. With its win against Miami (Ohio) last Saturday, the Eagles have won 60 consecutive MAC dual meets dating back to the 1997-98 season. During that span, EMU has won 10 MAC swimming and diving championships and 90 individual MAC championships. The Eagles won 11 of the 16 events against Miami to keep their streak intact. Three members of the Michigan water polo team collected weekly awards from the Collegiate Water Polo Association after their efforts at the Stanford Invitational. Junior Kiki Golden was named Player of the Week after scoring 10 goals and seven assists in the five games. Sophomore Kelsey Nolan was named Defensive Player of the Week after registering 10 steals and six field blocks. Finally, Elizabeth Williams was named Freshman of the Week after scoring two goals during the weekend. Michigan men’s tennis player Shaun Bernstein was named Big Ten Player of the Week after finishing 4-0 last weekend. It is the first time in his career that the sophomore has earned the weekly award. EMU women’s track and field runner Shantavia Williams was named the MAC Track Athlete of the Week. Williams took second place in two events and won a third over the weekend at Notre Dame's Meyo Invitational. Williams was a part of the distance medley relay that won in an EMU-record time of 11:30.21. She finished second in the 400-meter dash and the 4X400 relay. This is the senior's first award of the season.